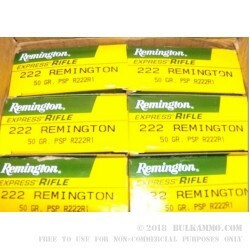 Introduced in 1950, .222 Remington ammo has an absolutely legendary story with regards to the American military and civilian shooting market. It was not only a well-known, effective round for use in varmint hunting in its earliest form, but it was a well-known, much used target cartridge for many years until the 6mm PPC unseated it. As a test bed cartridge casing it was the basis for the precursors and the final product which resulted in the adoption of the 5.56x45 cartridge by the US military and then by NATO. The .222 Remington is sort of an “always the bridesmaid never the bride” story, except in this story, the bridesmaid is smoking hot every time and still has a great set of wheels. 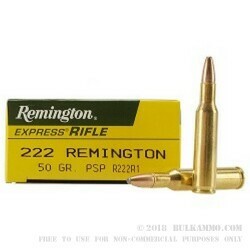 The .222 Remington has always been quite the performer and still enjoys an elite status in the world of varmint hunting and bench rest for those who have been smitten by its fast velocity and flat shooting trajectory. The Remington CoreLokt bullet that is in this load is a 50 grain PSP (pointed soft point) projectile and offers excellent service as a varmint hunting round as well as other small animals including coyote, etc. The static ballistics of the round include a 3140 feet per second velocity and a 1094 ft. lbs. of energy power delivery.